Coleraine captain Stephen O’Donnell believes Monday night’s game against Crusaders could kickstart the Bannsiders’ season. Oran Kearney’s men, who pushed the Crues all the way in the race for the League title last season, have yet to hit top gear with two wins and two draws in the Premeirship to date. 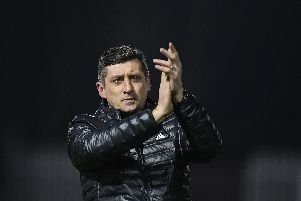 O’Donnell though feels the fact that The Showgrounds outfit have kept their long unbeaten run going will stand them in good stead, and the performances will follow in due course. “I think Monday night’s game could be just what we need,” he said. “It’s a massive game under the lights at Seaview and we will have another brilliant away support there. “Hopefully we can go and put in a good performance and get the result which can help kick us on to where we should be at. It’s fair to say we haven’t been as free flowing yet as we showed last year, but it will come. “It’s still early in the season, and to go through what he have so far with us not getting the results we would have wanted, but to still be unbeaten and still be up there with the leaders. If things had been different O’Donnell could have been coming up against Jamie McGonigle if Coleraine had accepted the Crues bid for the frontman in the summer. The Bannsiders skipper is delighted to have McGonigle is on his side and feels he will shine in front of the Sky Sports cameras. “We played the Crues four times last season and we managed a win and three draws,” said O’Donnell. “The 3-3 draw at The Showgrounds was a great game, but for me from a defensive point of view it wasn’t great. “Jamie was brilliant that day, he always seems to turn up against them. He likes big matches and the big stage. Meanwhile, Crusaders manager Stephen Baxter says his side are “getting over a European hangover” as they aim to build momentum into their league title defence. “We had two European away trips in a month and we were playing against unbelievable opposition,” said Baxter. “There’s a lot of effort goes in around all of that - it’s not an excuse, it’s just something that you see. “I just think there may have been a European hangover but we’re starting to see them come out of that. You’re asking players to do an awful lot of work.